Be the first to share your favorite memory, photo or story of Jeremy . This memorial page is dedicated for family, friends and future generations to celebrate the life of their loved one. 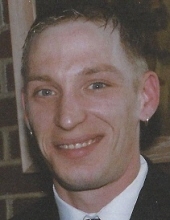 Jeremy J. Lefever, 38, Brockport, passed away Saturday, November 10, 2018 at Penn Highlands DuBois. Born July 12, 1980, he was the son of Vicki (Luke) Sicard, David L. Bowser, and Dennis G. (Jamie) Lefever. They survive. Jeremy graduated from the DuBois Area High School in 2000 and from Triangle Tech in 2003 with an Electrical Maintenance Degree. He was employed by Owens Illinois Plant #19 on the hot end as an operator. Jeremy loved hunting, fishing, and spending time with his two girls, Brianna and Brooklyn. He was an avid Steelers and Penguins fan. Jeremy was Methodist by faith. In addition to his parents, Jeremy is survived by two daughters, Brianna Jaylynn Lefever and Brooklyn Mia Lefever, Brockport; his fiancée, Michelle Lynn Bizzak, Brockport; his sister, Sheena Bowser; his paternal grandmother, Charlotte Lefever, DuBois; his maternal grandmother, Joan Heindl, DuBois; a special uncle, Ryan Heffner, as well as several aunts, uncles, and cousins. Jeremy was preceded in death by his paternal grandfather, Gene Lefever, and his maternal grandfather, Roderick McDonald. Friends and family will be received Tuesday, November 13, 2018 from 5-8 p.m. at the Adamson Funeral Chapel, Inc. A funeral service will be held Wednesday, November 14th at 11 a.m. from the funeral chapel with Rev. Corben Russell officiating. Interment will be in Morningside Cemetery. Memorial donations may be made to the United Cerebral Palsy Organization of Pennsylvania, Attn: Kirk Demyan, 200 North Third Street, 8th Floor, Harrisburg, PA 17108 or online at ucp.org or to the organization of the donor’s choice. To send flowers or a remembrance gift to the family of Jeremy J. Lefever, please visit our Tribute Store. "Email Address" would like to share the life celebration of Jeremy J. Lefever. Click on the "link" to go to share a favorite memory or leave a condolence message for the family.